My mother in law came into town this week so the limited after work hours have been spending cleaning the house and garage. This resulted in limited shop time so I decided to put together a test piece for the leg finish. I had purchased some green and yellow from the Old Fashioned Milk Paint company with the intention of using on the next project. I used a cutoff piece and used my smithing plane followed by two coats of yellow. 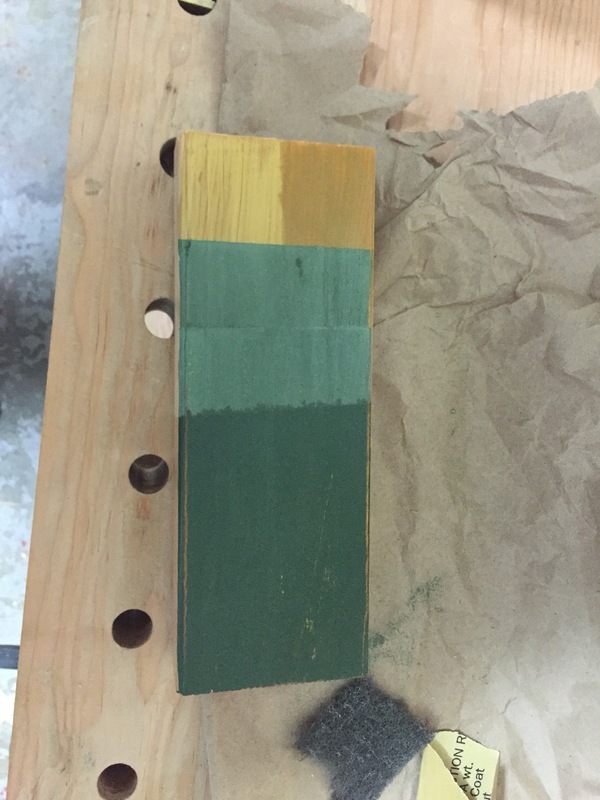 Then I added a coat of oil to one side and added two coats of green. The first coat of each color got lightly sanded with 400 grit and every coat was burnished with a between coat sanding pad. Then a coat of oil in the green. I had some adhesion problems with the green over the oil so I am glad I did a test piece. I’m also not super happy with the resulting color but I will see what SWMBO thinks. I’m also planning on trying the red under black finishing regiment from the Chairmaker’s Notebook. I have ordered some Van Dyke crystals and once they arrive I will give it a try. My flight back on Friday ended up being delayed 2 hours so I got home after midnight. As a result, Saturday was a bit of a wash woodworking wise but progress was made on Sunday. 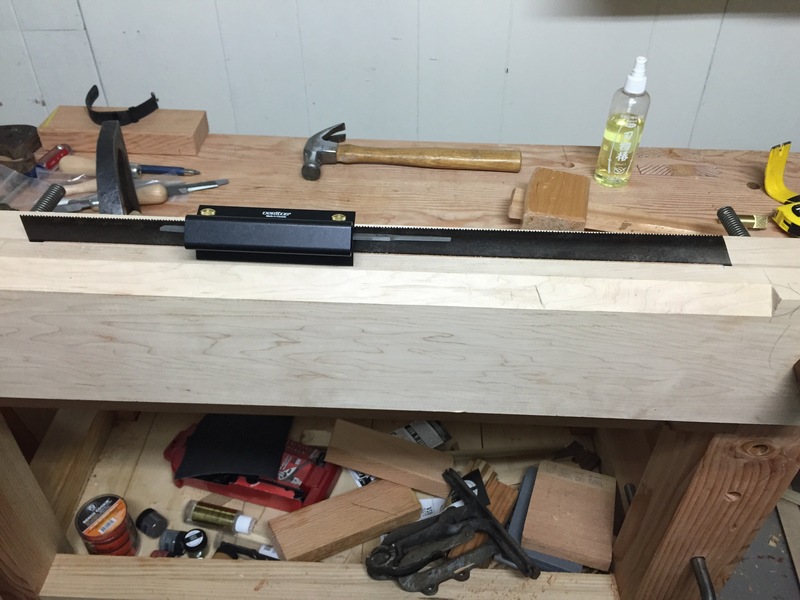 For cutting the tenons on the verticle components, my Moxon vise raises the height just enough to make the cross cutting easier. One leg assembly is ready for final fitting and smoothing (the bridle joint for the cross piece will wait until smithing is done). The main joint is complete for the second assembly but the half lap socket still needs to be cut. 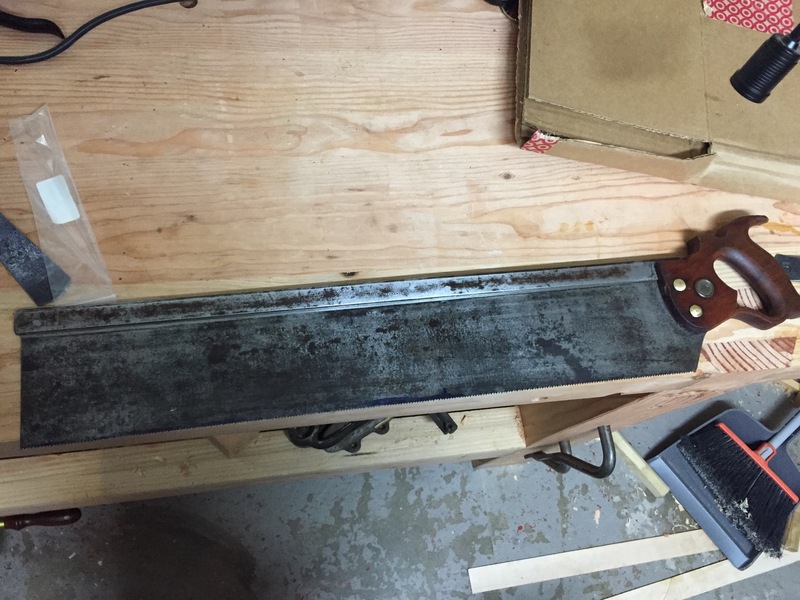 last night I finished sharpening the saw and cleaned up the handle and screws a bit. The handle got a light rub down with 22o sand paper before I applied a 50/50 mix of true turpentine and BLO using a sanding pad. Once that dried I added some more BLO to the mix for a second application. The brass screws got a rough cleaning with 4oo grit. After a few test cuts i coated the whole plate and back with some paste wax and added some oil to the guide sleeves. 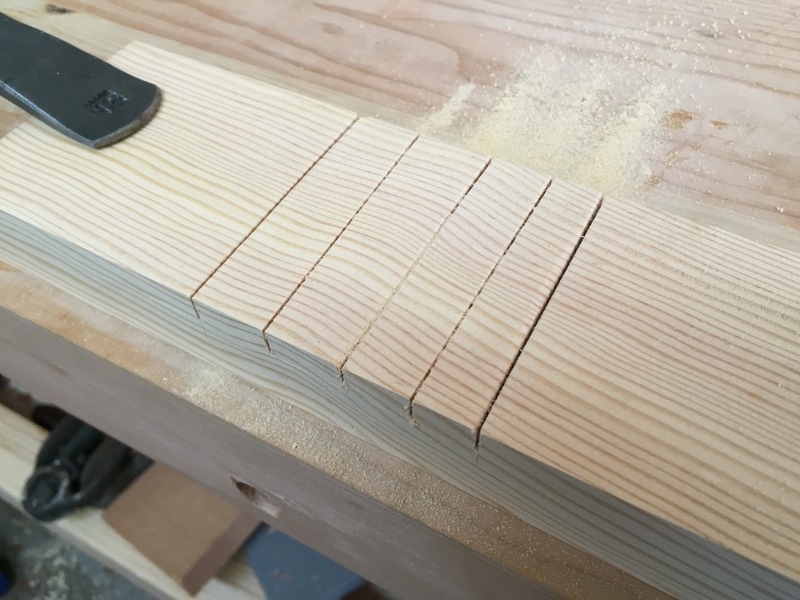 A few more test cuts showed clean and accurate cuts so I decided to trim the ends of a couple of leg parts which resulted is a cutbthatvwas very much out of square. Luckily I I had left a bit extra so I think it will be okay. Before I called it a night I added a coat of straight BLO which looked pretty nice this morning. I’ll give it a few days to cure (in traveling for work) and then illnprobably add a coat of wax. You know how sometimes what should be a simple task snowballs into a bunch of work? Well that happened to me tonight. 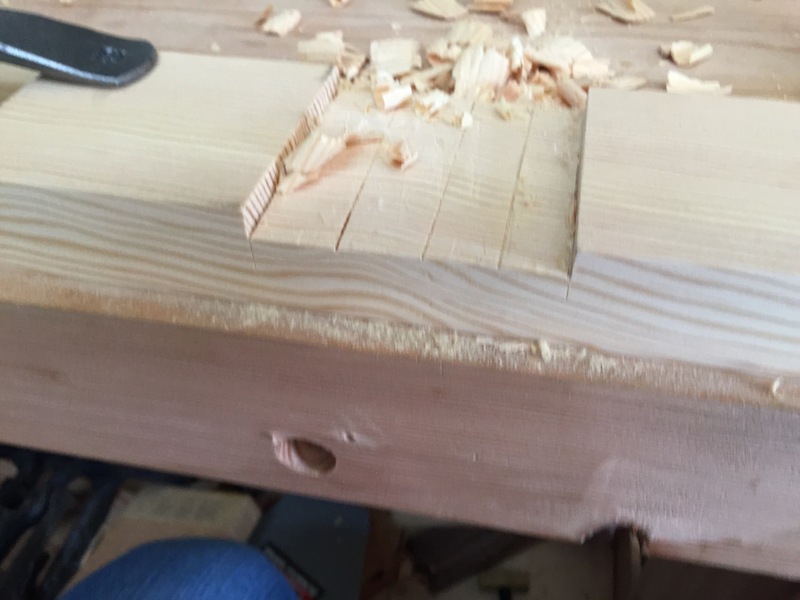 I left work early (it was a holiday after all) and intended to start cutting the table leg pieces to length. 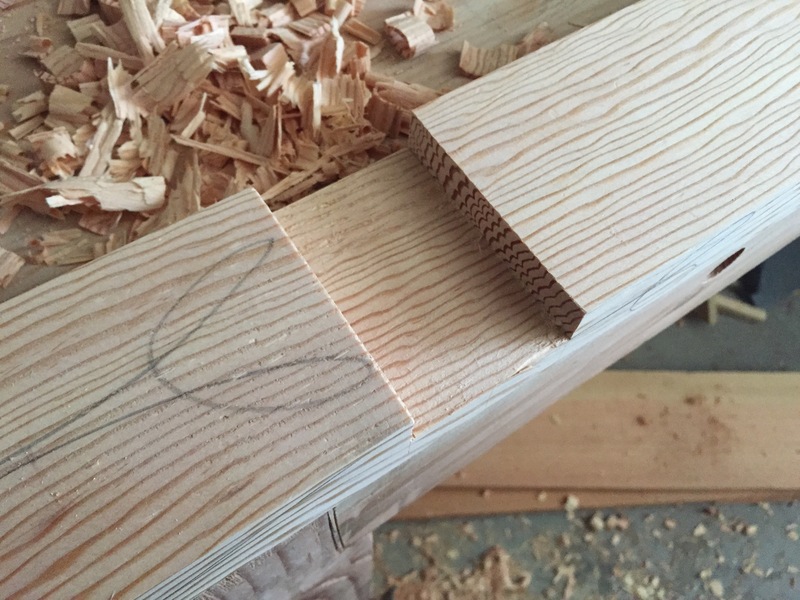 Since some of these cuts would be angles I decided to use the large miter box I had acquired on eBay a while back. Unfortunately the saw was unbelievabley dull and my small Stanly 150 miter box is to small for the pieces so I decided to sharpen the saw. 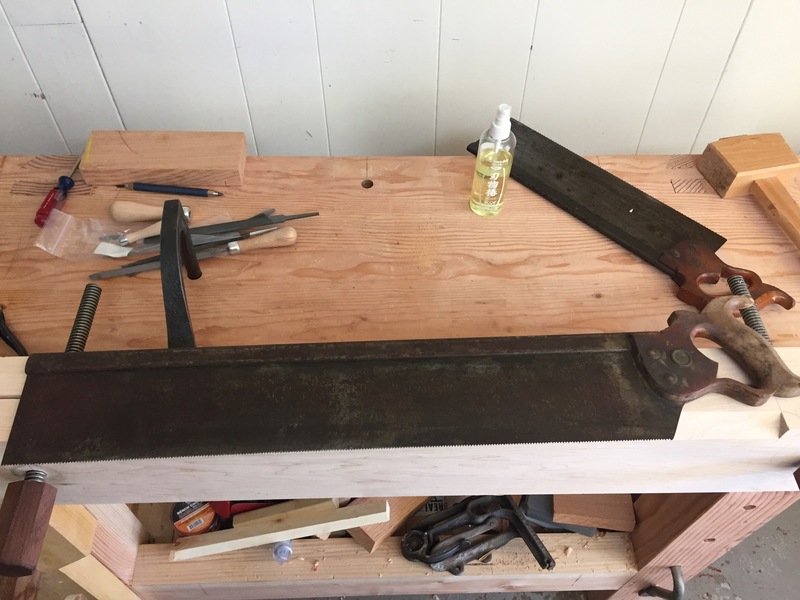 After taking the handle off I realized the back had been tapped down unevenly, resulting in a 1/4 less saw plate between the teeth and the back at the toe when compared to the heel and the middle had been tapped down even more. 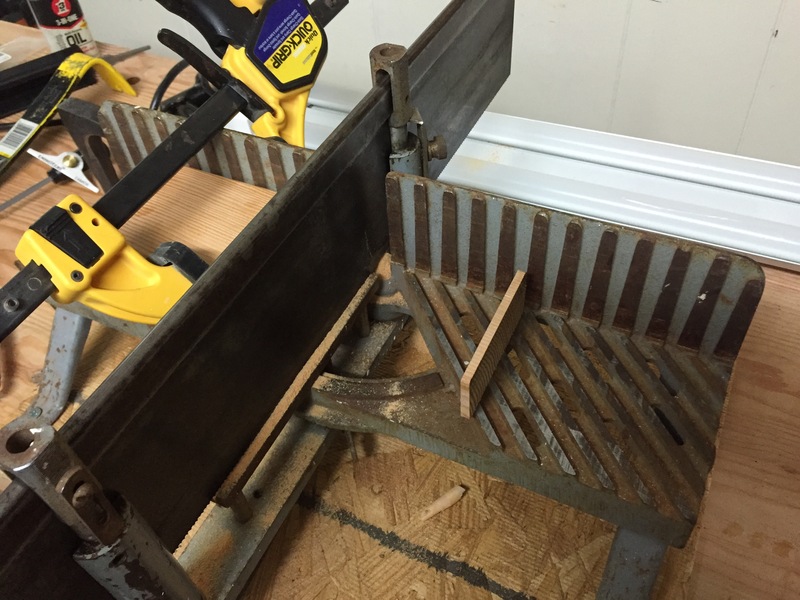 I resolved to remove the back and remove as much rust from the plate as I could. After struggling to remove the back for 55 minutes I filled the back with wd40 and 3in1 And took a few hour break to have dinner and put the kiddo to bed (the stiches fron the surgery have been bothering him). After returning to the garage it took another 45 minutes to wrestle the back off and my workbench tail vise is a bit dirty with oil now. 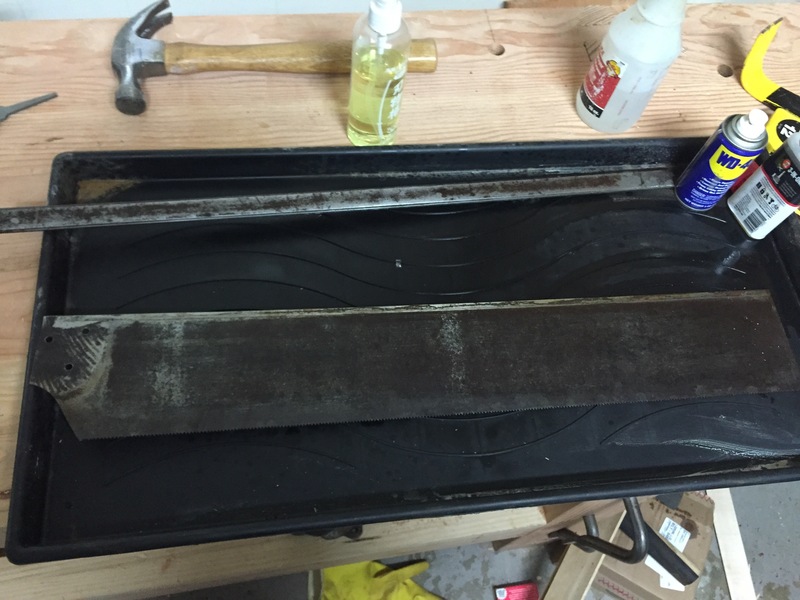 After sanding away as much rust as I could, it was time to joint the teeth. 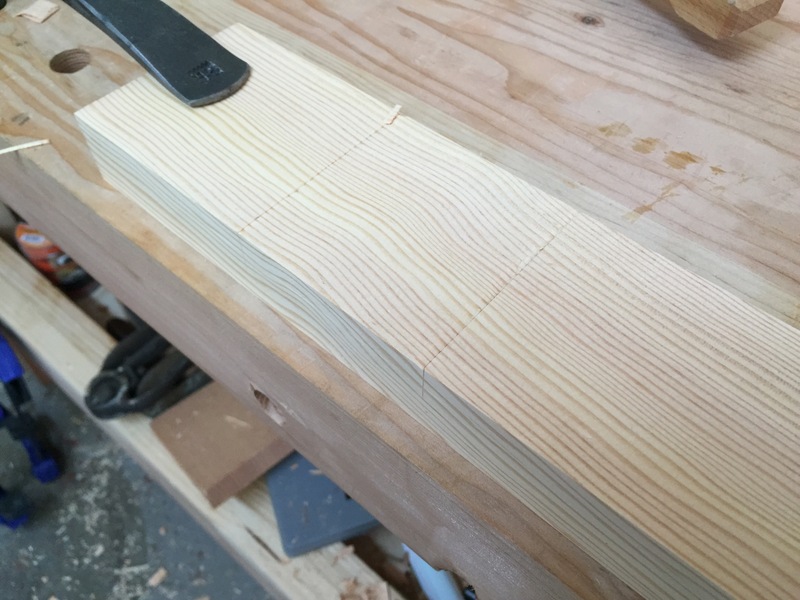 This took quite a while because as with most miter saws, this one had a substantial dip in the middle. I then shaped the teeth (keeping the saw perpendicular to the plate) until the flats were removed and then reinstalled the back. This time the distance between the teeth and the back is consistent along the length of the plate. Tomorrow I will sharpen the teeth, adding the fleam this time, and do some work on the handle. 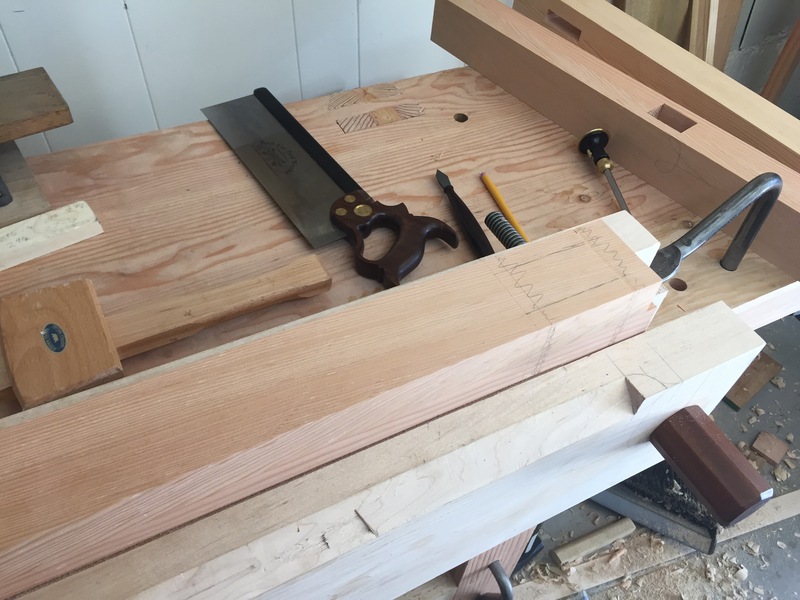 It has been so long since I did any joinery work that I had to read my blog posts to figure out how long it had been; November 2nd 2015. 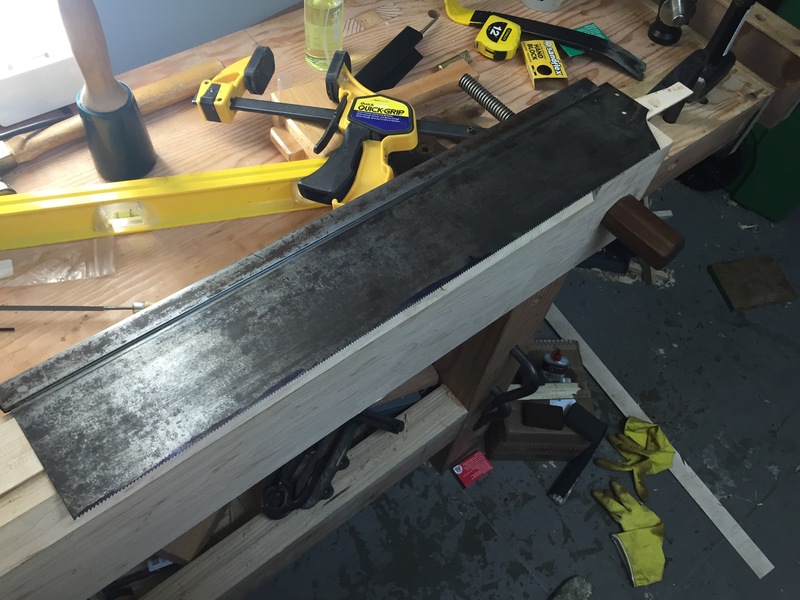 Well this weekend some major progress was made on the table legs. Thanks to the planet all of the parts are milled and the mortices have been cut. There were a few minor errors but overall things went together well. 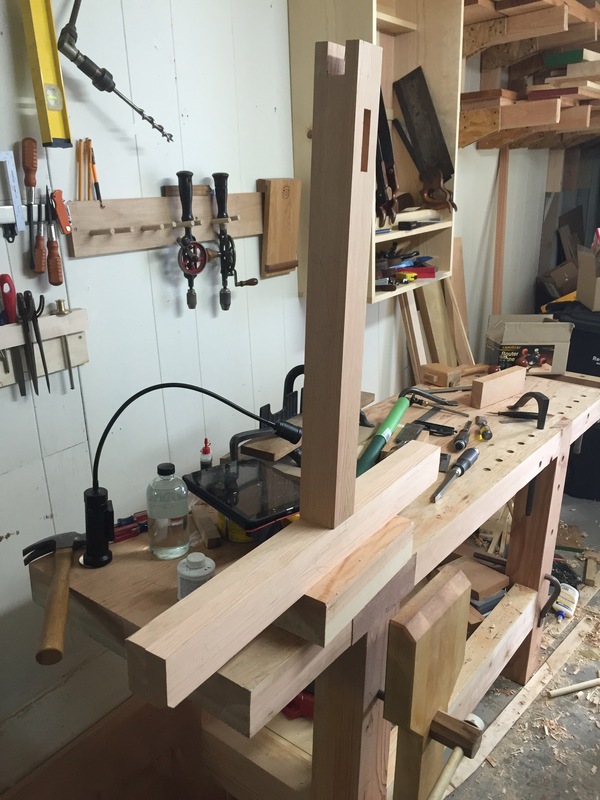 Now I just need to square up the mortice sides, cut the parts to length, and start cutting the tenons. well so much for “winter”. 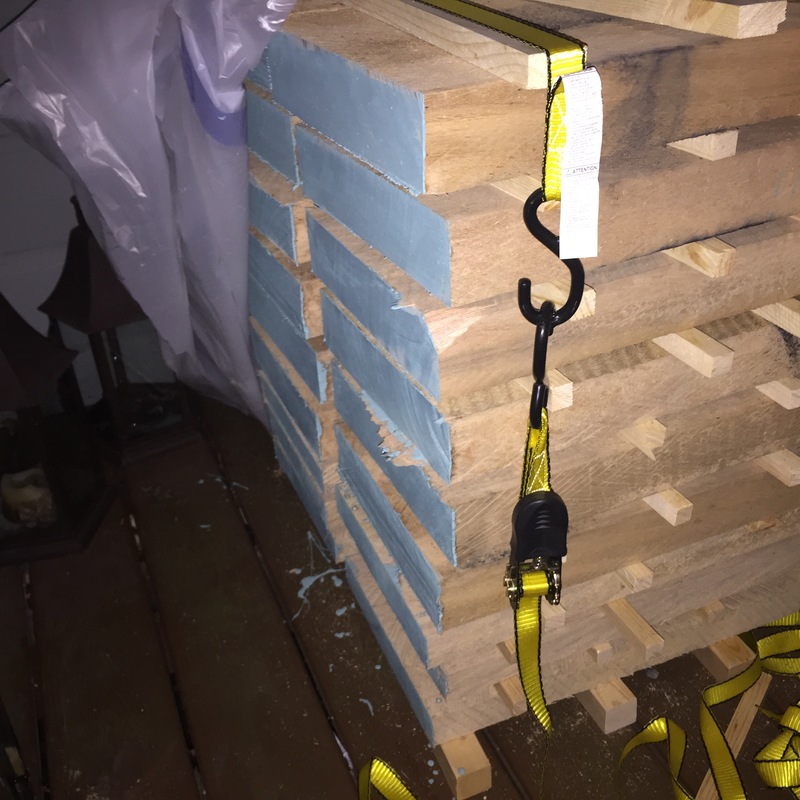 When I got back into town over the weekend I noticed there was no rain in the forecast so I pulled the plastic off of the lumber stack to get the drying process started. What’re I didn’t anticipate is the 70+ degree weather, high winds, and the utter lack of fog. Wednesday afternoon I checked on the stack and noticed that the weather had not been kind. Two think boards and one thin one had some pretty major checks. I have twice as many thin boards as I need but it looks like I lost a full chair seat. I need to figure out where my moisture meter is and do another test but in the meantime the plastic went back over the stack. Update: I found my moisture meter and no wonder they cracked; some of the boards near the top had dropped to 20% moisture in only a week and a half. Towards the bottom it was a more reasonable 27% but I’ll leave the plastic over the stack for the next couple of weeks. Well it’s always a good idea to get another opinion so after I block stacked my eucalyptus on sat I made a post on the Woodnet forum. Luckily, someone pointed out that the block-stacking and the plastic wrap in the study were probably related to the Boron treatment and sure enough, some more google searching found that is indeed the case. 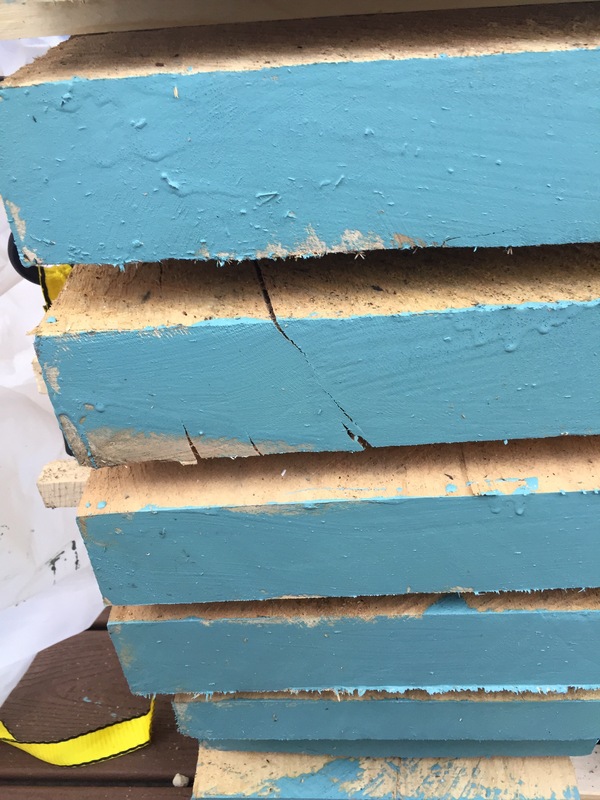 A summary of other studies suggested applying a plastic sheet over the racked lumber in the first few weeks would be a good idea. 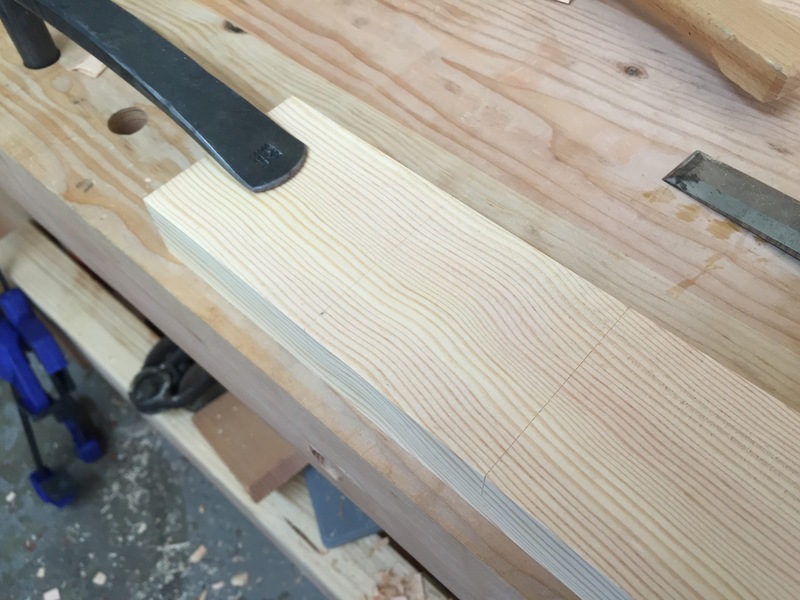 I also discovered that I should have painted the end grain immediately after cross cutting to reduce checking. 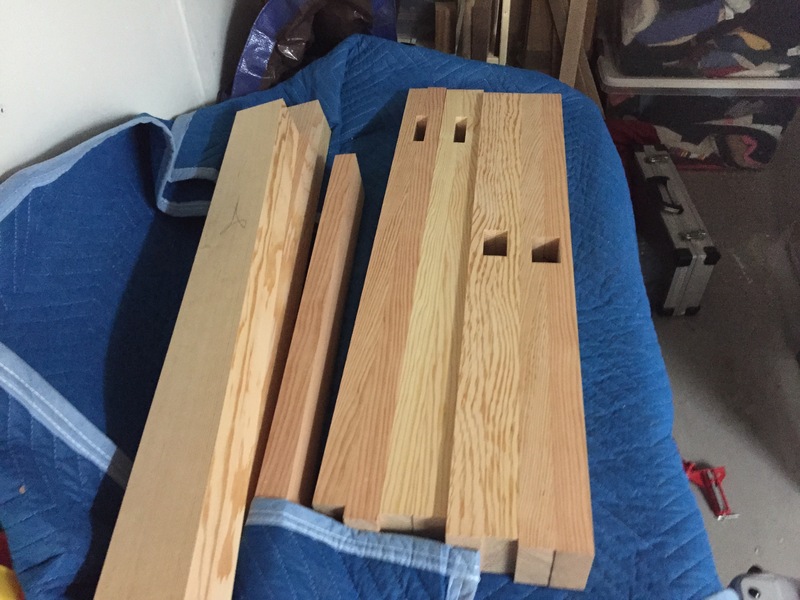 So apparently tonight I am going to be painting end grain and re-stacking the boards with air gaps. Hopefully I have not done too much damage. I will still have the plastic sheeting over it for a few weeks to slow things down. Update: luckily the hardware store in the financial district had some 1 by 2 pine and we drove to work today so when I got home I cut them down to size and used the band saw to rip them in half. The. My shop assistant helped me to restack the lumber and painted the end grain with some leftover latex paint. The wratchet straps will keep the stack from getting knocked over and the plastic sheeting will slow the drying process and keep off the rain.